The legendary train of Palace onWheels is a jewel in the crown of luxury trains in India. Not only is it the first prestigious luxury train of the country, but also is a frontrunner of the indulgent legacy of the Maharajas. 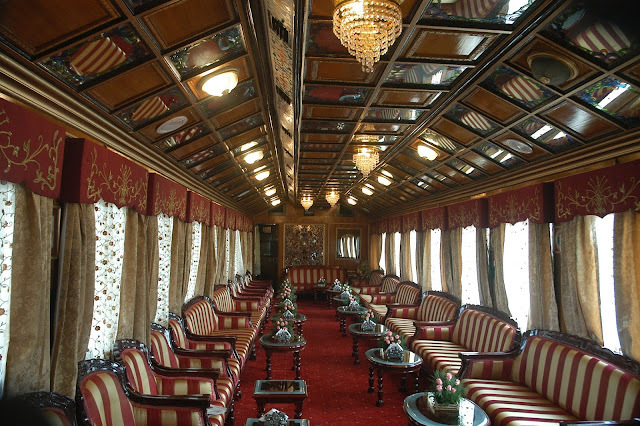 This one of a kind train is conceptualized on the royal theme in order to provide unique experiences to the travellers. Launched for the world three decades ago, this special train is more than just an answer to the western world’s Orient Express. It is an ambassador of the Rajputana heritage. Everything right from the coaches, their ambience, the antiques, paintings and other elements present within the train resonate with the glory of Rajasthani royals. This inspiration behind the Palace on Wheels projects the train on a larger than life scale. Tourists long before boarding this train have many surreal images and all of those interpretations fall short of the actual journey aboard this moving palace. As the name suggests, the train is bedecked with palatial indulgence in order to pamper the passengers in the Maharaja way. Right from the tastefully done passages to the plush setting of the suites; everything here is vibrant, gaudy and royal. The coaches used in this special train too have a royal background. They were originally utilized as the personal railway saloons of the princely rulers of Rajputana, Gujarat, Hyderabad and the Viceroy of British India. Legends say that these erstwhile rulers had opulent lifestyle, which they carried with themselves even during the journey aboard the then launched railways of India. As a part of their status statement, these coaches had everything right from food, drinks, and ice cooler to keep them fresh in the arid climate. The legacy still continues wherein the coaches are named and furbished on the lines of glorious Rajputana kingdoms and their opulent setting. The 14 coaches inside the train are named upon and inspired by the former Rajput kingdoms like Alwar, Bharatpur, Bikaner, Bundi, Dholpur Dungarpur, Jaisalmer, Jaipur, Jhalawar, Jodhpur, Kishangarh, Kota, Sirohi and Udaipur. More than that, each coach matches the aesthetics and interiors of the royal past with the thoughtful recreation of magnificent ambience. The coaches inside the train accommodate 52 twin bedded saloon, two restaurants and a bar car in its basic set-up. Even though the basic coaches are still the same, the facilities have been upgraded to suit the modern traveller. Each saloon has a mini pantry and a lounge where the beverages and refreshments can be enjoyed at ease. Another add on to the kingly hospitality within the Palace on Wheels train is the inclusion of Khidmatgars, the loyal attendants for that magnificent royal experience aboard this luxury train. Always at the passenger’s service, these loyal attendants are equipped to take care of all their travel needs. Besides the wonderful world of this special train, the passengers also get to know the India resting in its forts, palaces, deserts, wildlife sanctuaries through a daily tour to heritage destinations. These excursions bring the best of India closer to the tourists. 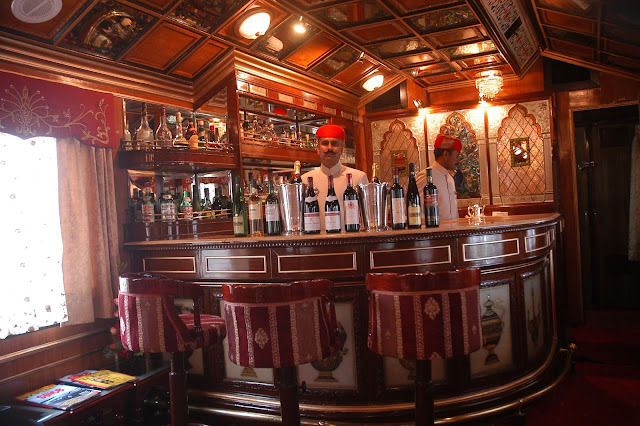 Aboard the oldest luxury train in India, tourists can visit the cities like Jaipur, Sawai Madhoupur, Chittorgarh, Udaipur, Jaisalmer, Jodhpur, Bharatpur in Rajasthan and city of Taj, Agra in Uttar Pradesh. Truly, a tour through this plush train is a week in wonderland where numerous surprises are waiting to unfold themselves in this surreal journey. The best of heritage and modern times come on a roll during this paradisiacal India Palace on Wheels tour. It would be justified if we say that this glorious luxury train is a link between India’s illustrious past and present.